I thought I'd step aside from my usual photoshoot blogs and instead give you something different: a look at the wide world of photography printing. My oh my how it varies by where you choose to get your prints printed! I do provide all of my clients who choose to print their images on their own this handy printing info PDF with some tips and insight on where to print...but in addition to that now, I will be providing them these handouts as well! Because you just paid a good amount for my services, you should want to get them printed at a place that replicates the same quality I have delivered to you in your digital images! Obviously my top printing recommendation is to print through me (I use the professional print lab WHCC, which has amazing quality and ridiculously fast shipping! ); however, for those who choose not to (and that's okay!! ), I'm giving you this here post to enlighten you as to where you are choosing to have your prints printed. Just because a place is offering free prints -- or super cheap ones -- doesn't mean you should print there! 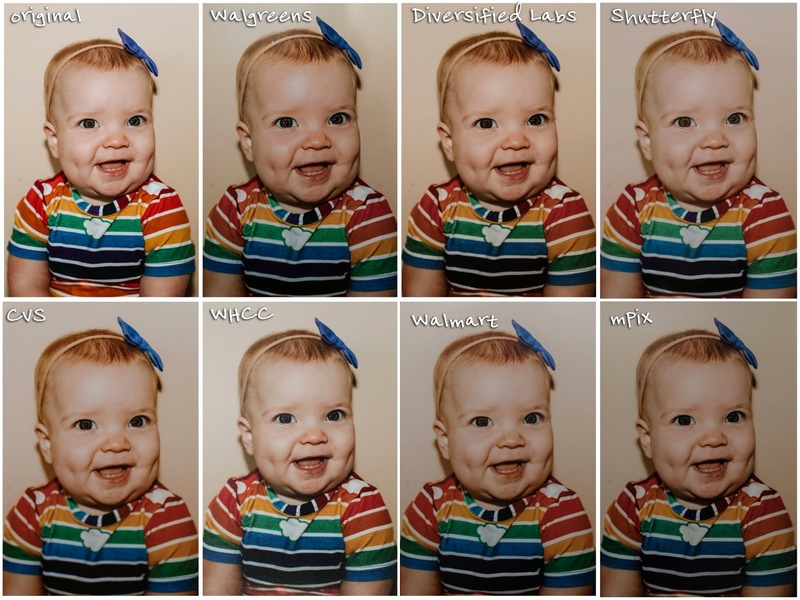 You just spent a good chunk of change having your pictures done by a professional -- you owe it to those snaps to have them printed by one too! I want to note that I have done zero editing to this pictures -- I simply took a picture of them, collaged them together, and tossed the print shop's name over it. That's it. I have been skeptical of these posts in the past thinking that surely a bit more editing was done to exaggerate the quality and color differences but I promise you I have not done anything to alter these -- they are as close to having all of the prints in your hand to compare as I could get! 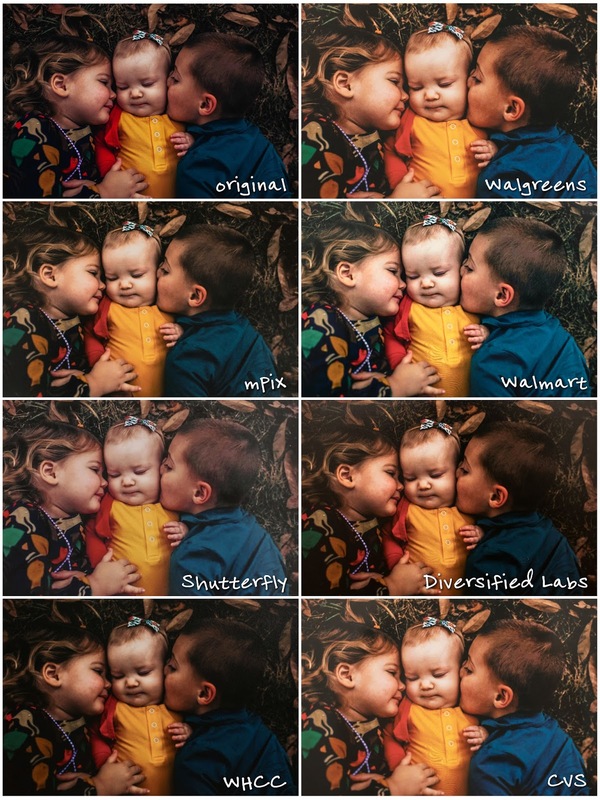 I included the original image and then chose 4 of the most popular 'quick print' places to have these printed at (Walgreens, CVS, Wal-Mart, and Shutterfly) and then my 3 top recommendations (mpix, WHCC, and Diversified Lab Services (local STL print lab)) where I recommend my clients get their pictures printed. The differences are astounding. Some more evident than others, but still, such a variety of qualities across the board! I want to note that this post is in no way bashing drugstore or 'quick and cheap' photo labs...more so to educate you, the consumer and client, as to the differences and qualities in where you are having your images printed! Those drugstore print labs are definitely quick -- and I'd be lying to you if I said I didn't use them every now and again when I need some prints ASAP (like when I find out the night before I need to send in family pictures for my kids' preschool projects for the next day: Walgreens to the rescue!). However, if I'm printing images to display in my house or give as gifts, you bet I want to make sure they are printed well and as close to my original as possible. 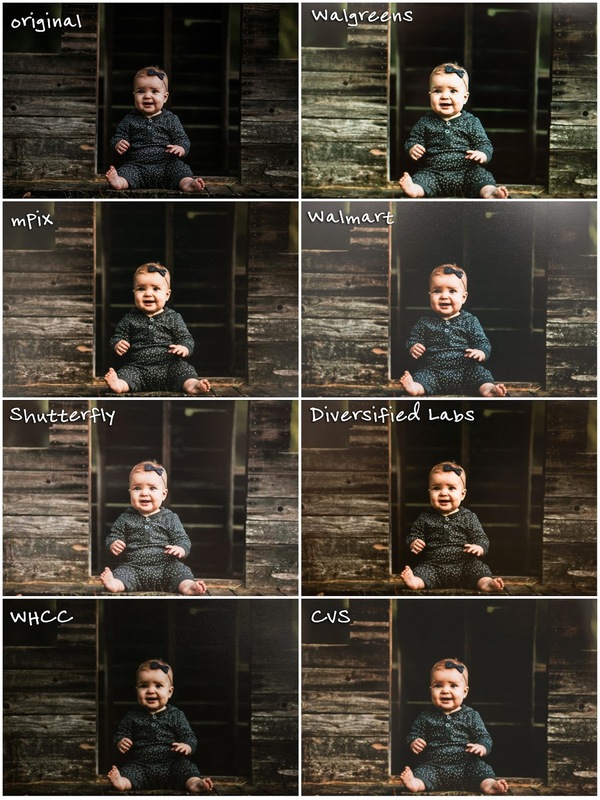 I hope this post has been informative to you in showing you the differences you can get when printing your snaps. I want all of my clients to be as happy with their prints as they are with their images, so I hope this insight proves helpful in your choosing of where to get your snaps printed!